David Arthur Granger, President of Guyana, addresses the general debate of the 72nd Session of the General Assembly. said the road to achieving peace and successfully implementing the SDG’s depends on cooperation and dialogue. 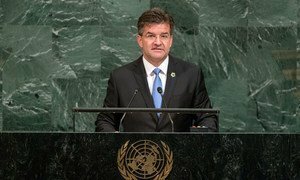 Opening the annual general debate, the President of the United Nations General Assembly today stressed the need for more work on prevention, a greater focus on people, and keeping promises made to advance prosperity and protect the planet.